Not that Apple is being dishonest – it is just cleaning house and winding down the practice of tons of free storage given to MobileMe subscribers who migrated over to iCloud. All iCloud subscribers get a complimentary 5GB of storage; nice, but hardly enough space for even the smallest collection of apps, photos and music, considering iPhones are available in sizes up to 64GB, and who knows what amped up capacities Apple has in its pipeline. Since many of us have 64GB iPhones, that’s a $100/year expense if you want a full backup of our phone. Certainly that’s not a lot of money, but these little sums add up. Yet there is a way to avoid paying for cloud storage, and that’s by using your Mac to back up your iPhone. Besides the cost advantage, it’s also a quicker process to restore the phone from your computer as opposed to restoring from the cloud. This is accomplished by plugging your USB sync cable into your computer instead of a standard charger. Launch iTunes and highlight your iPhone in the left sidebar and select “This computer” in the Backups pane of the iTunes window. If you crave immediate gratification, simply click on the “Back Up Now” button, which starts the process. 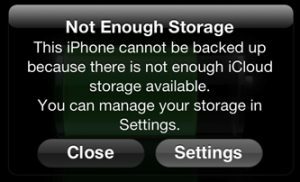 Note that your iPhone will be backed up on your computer; and the computer will be backed up to your external drive or Time Capsule. Understand there is more to this story – part of this service includes Documents In The Cloud – which is online storage of iWork documents (Pages, Numbers and Keynote). However, I haven’t seen a mass exodus from Microsoft Office to iWork, and haven’t fielded many inquiries about iWork cloud storage.